Let’s try something different when presenting work in progress on my miniatures. In the past I would post every time I picked up my brush. Sometimes I found it difficult to find enough words to fill out a post and often I found myself repeating the same things over and over again. With my new blog I am going to present a week’s worth of painting in a single post. Hopefully this will make it easier to find something to talk about while giving me a nice routine. 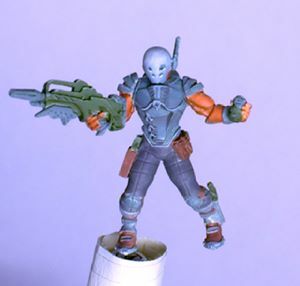 Nomad Intruder, flatted and ready for painting. 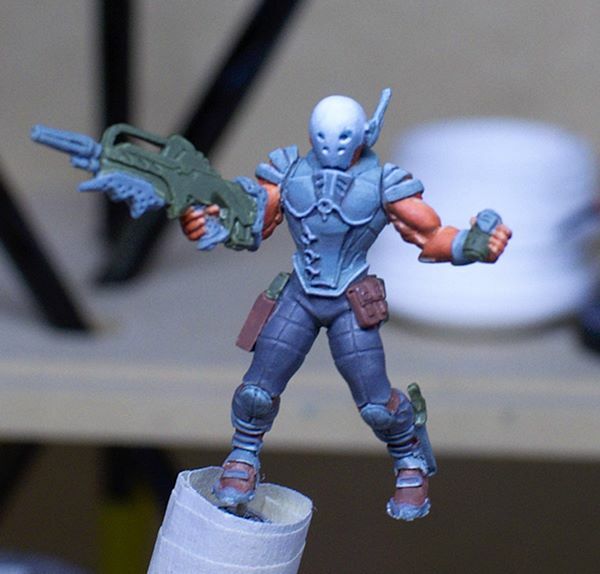 Infinity miniature by Corvus Belli. 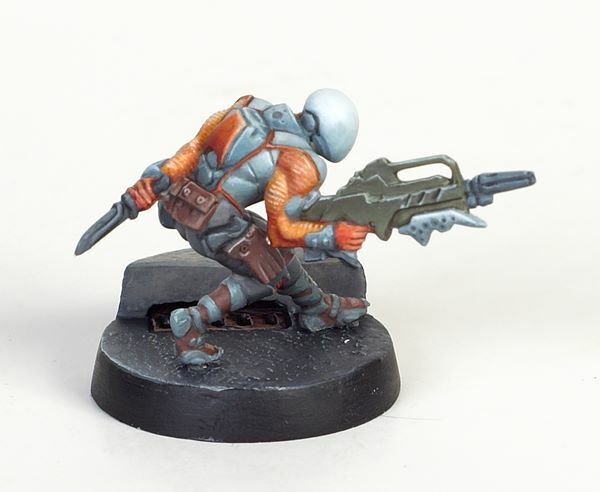 I am painting a Nomad Intruder for Infinity by Corvus Belli. 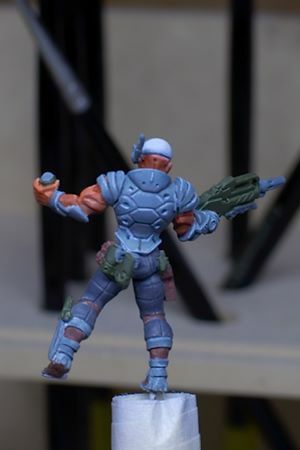 The model has a standard combi-rifle and came in a blister with a multi-sniper rifle armed Intruder. I am going for a good army standard but I’m trying not to fuss too long over the miniature. With my sudden and inevitable interest in Deadzone I want to get these miniatures painted. 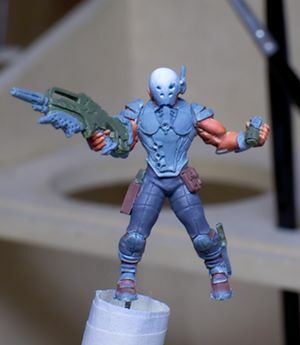 I already described in my Flatting article why I basecoat the way I do. Please note that this miniature isn’t perfectly flatted. There as some small gaps between the colours. It’s important that there is no bare primer showing through because if there is that spot is likely hard to hit with a brush and fixing it during the rendering stage is difficult. At some point, I can’t remember when and I didn’t take a good picture, I painted the orange of the arms. Tuesday I worked on the helmet. I was trying to match my Zero‘s helmet but I’m not sure I got it perfect. After futzing around with it for too long I reminded myself that I wasn’t entering a painting competition. Wednesday I worked on the steel grey of the chest armour. There are actually a lot of areas on this miniature that will be this colour but I wanted to get all stages finished. The other areas of this colour can stand to be a slightly different shade so re-mixing the colour isn’t a worry. This time I didn’t futz as much before reminding myself that I was just trying to get the miniature on the table. Here the chest is finished. I’m not sure I got the contrast where I want it but this is meant to be a play model, not a competition piece. Yes, I do need to keep reminding myself. 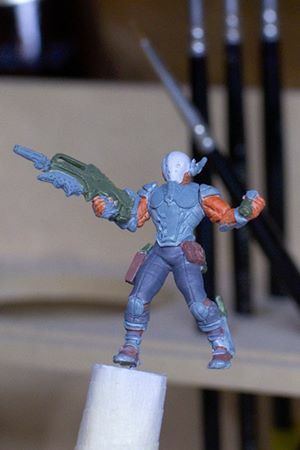 Infinity Miniature by Corvus Belli. I wanted to show the back of the armour. I like the shading I’ve done, and I find the panels very interesting. This is exactly why I think that having a full week of WIP images for a miniature really pays off. All I managed today was to paint all the green on the weapons. I did it quick with little blending. The surfaces are so small it’s not necessary. The rifle is just slabs of flat surfaces so there’s no real need to blend there. There isn’t much left from here, the boots and leather parts, the hardware on the weapons and boots and then the pants. If I can finish this miniature in the upcoming week I’ll be very happy. The gun was flat slabs which received flat colours and edge highlighting.